They came, they wrote, they mingled. Some forty writers, or supporters of writers/writing descended on the beautiful town of Creston for a weekend of words. 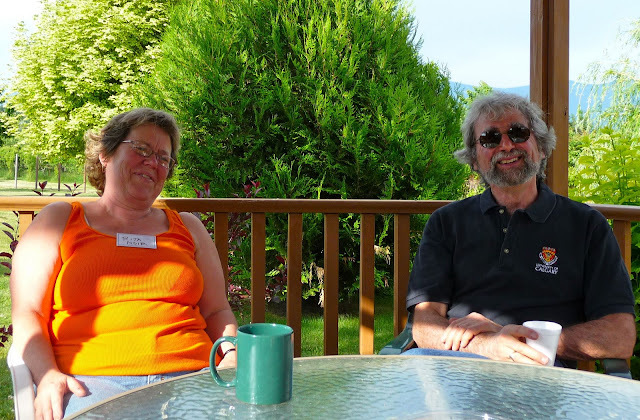 By Sunday night, Write in the Kootenays was a smash hit! A huge hug of thanks to Anne DeGrace, our regional rep for the Fed. 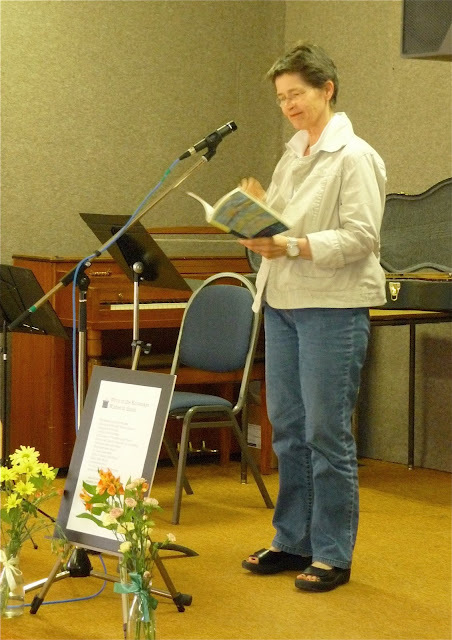 BC Writers, and to Luanne Armstrong and the gang from Creston for a marvelous weekend. From the time we arrived at the Creston Library, which I last visited almost six years ago when Sandra Gulland gave a reading there (if you click on Sandra's link and go to the bottom of the page, you'll see her comments about her trip to the Kootenays), to the wrap-up social on Sunday afternoon, we were fed, both physically and spiritually, and feted. The volunteers—and they were legion—were helpful, knowledgeable, and unerringly cheerful, like these two lovely ladies, Fern and Jeanne, who sat at the registration table. Panels and workshops filled both days! I wish I could have attended all of them, and I really mean that. Rita Moir, Morty Mint, Luanne Armstrong, Verna Relkoff and Keith Liggett, Director of the Fernie Writers Conference in July and editor at the Red Berry Press sat on a panel about the state of the publishing industry. Luanne Armstrong talked about how to teach writing. 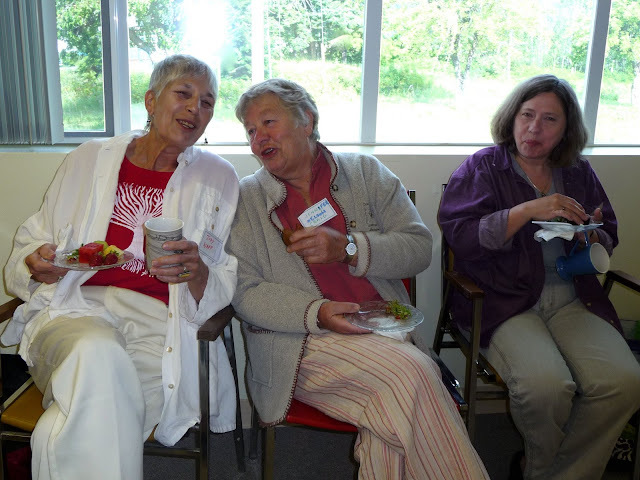 Angie Abdou, left, relaxing after giving a workshop on capturing physicality in writing. Anne DeGrace talked about how to make a writing group work for you. Antonia Banyard (here, right), Verna Relkoff and Sioux Browning offered blue pencil sessions. There was even time for a little writing. In the evenings we enjoyed readings from workshop presenters and participants. Holley Rubinsky treated us to one of the super-short stories she's working on. Deryn Collier is working on a really neat mystery and shared a creepy part with us! 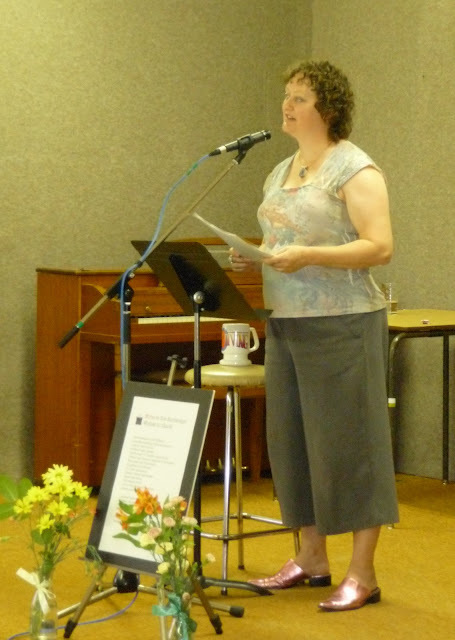 Tanna Paterson read an excerpt from her novel that will be published in 2010. The audience was definitely on-side with poet/screenwriter Sioux Browning's poem. 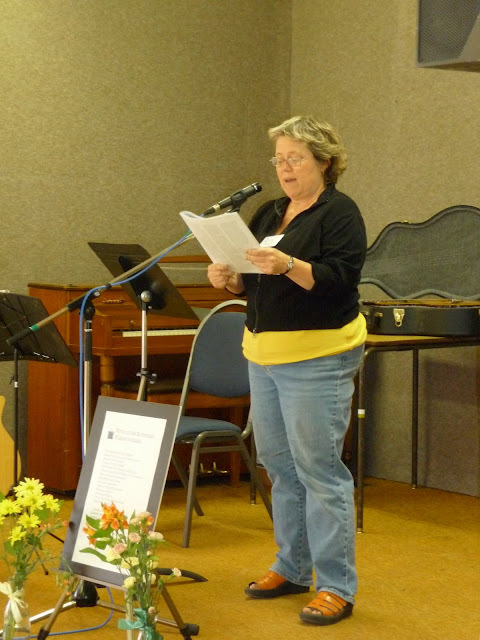 Susan Andrews Grace read three poems from a work-in-progress and gave a fabulous workshop on the serial poem on Sunday. Keith Liggett gave us a wonderful story about how the Irish invented skiing. Kuya Minogue had us sitting on the edge of our seats with her reading about a climbing disaster (possibly to lure people to her workshop on Zen Writing). Rita Moir took us into Mrs. Lawrence's grade three class for an Off the Page adventure. How's this for a happy audience? There was plenty of time for schmoozing, starting with coffee (or wine, depending on the time of day) at the gazebo at the Bavarian Orchard Motel. The entertainment was great, with genuinely funny skits and wonderful singing. The open mic sessions were as exciting, varied, poignant, amusing, challenging, and thought-provoking as open mic sessions usually are. 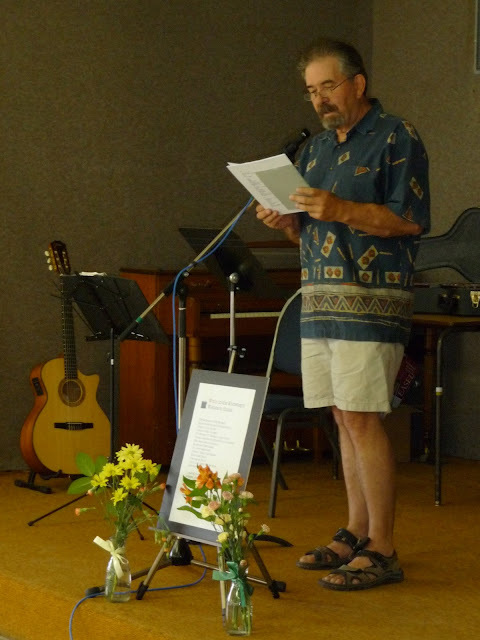 I appreciated the opportunity to try some poems on a largely new-to-me audience. Christine Sutherland working wonders on Anne DeGrace's neck. Three bags full of goodies from Nelson, Fernie and Creston were toonie-auctioned off. What a great way to raise a little cash (for the like-most-arts-related-organizations-perennially-cash-strapped Federation of BC Writers). Authors donated 20% of book sales back to the Fed, too. Rita Moir and Tom Wayman, getting ready to talk about the conference with Sheryl MacKay on CBC Radio's North By Northwest Sunday morning. 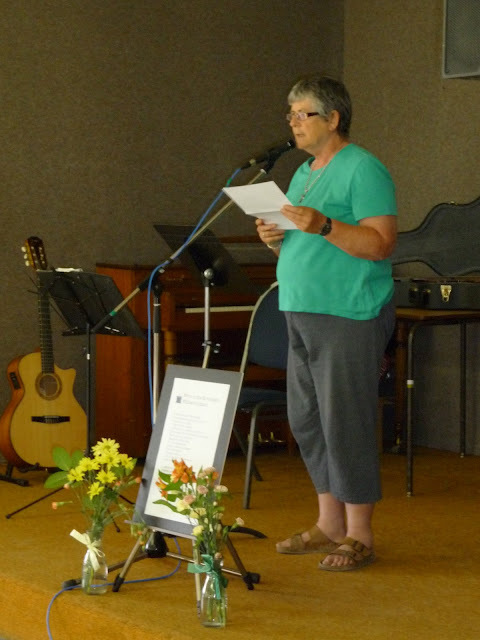 Heather Haake and I presided over The Roving Book Table, an ad hoc Kootenay institution that began when the (still sadly missed) BC Festival of the Arts was in Nelson in 2000. So often such events are held at a multitude of venues, so Heather and I devised a still-in-progress method of schlepping books from one location to another, whilst keeping track of them all and selling them to anyone with a little cash, or a cheque, or the willingness to part with unborn children, although we've noticed it is often the ones who have been born that people are more enthusiastic about parting with. Here's the RBT from behind! 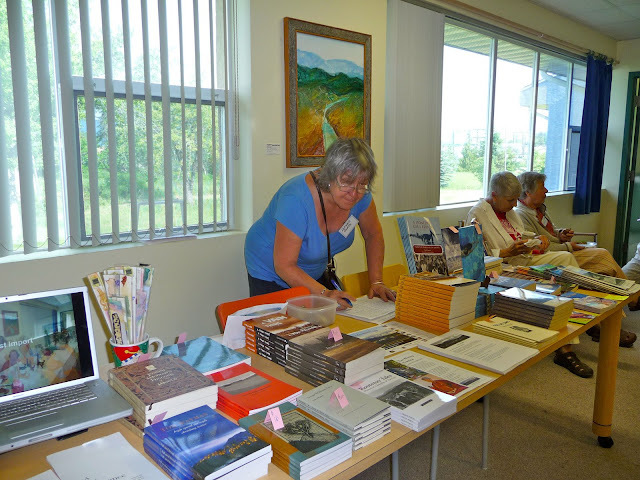 Someone checking out Arlene Pervin's (left) Kootenay Tales: Historical Glimpses of the Past. "Poetry, which nobody wants to buy, stands nearly alone in possessing the potential to speak the truth. Its location outside the rule of money gives it a perspective unique in our dollar-haunted society. Precisely because poetry has no cash equivalent, poetry is both literally and metaphorically priceless." And here we are, counting the filthy lucre. We love this part. (Too bad there are no pix of us tearing our hair out when we were figuring out who got what and how many books were left and so on). If you live in the South East region of BC and you write, you might consider joining the Federation of BC Writers. We have a Yahoo group listserve where already there are rumblings about what we're going to do next year!